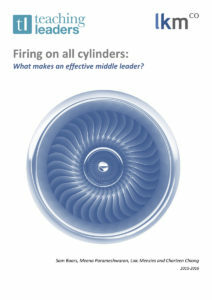 Home » Blog » Reports » Firing on all cylinders: What makes an effective middle leader? ‘No school can be a great school without getting the middle leadership right’ says James Toop, chief executive of the charity Teaching Leaders. 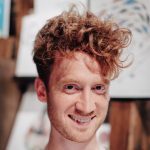 But what does it mean to be a great middle leader? At a time of rapid curriculum change and increasing concern about teacher retention, it is a question in desperate need of an answer. Indeed, could inspirational but efficient middle leadership provide an under exploited lever for school improvement? Today we’re launching a new report for Teaching Leaders which suggests it might – and here’s a lovely visual summary of it from @ImpactWales. The report analyses middle leaders’ effectiveness, how they go about their role and what helps and hinders them in their job. The report is based on three sets of data. First we analysed data from English, Maths and Science departments that were headed by Teaching Leaders Fellows and compared their departments’ performance to the rest of the school. This meant we could look at performance in context and see when school A’s maths department particularly stood out from the rest of the school. We then looked at their Head of Departments’ assessment centre scores from when they applied to the Teaching Leaders Fellows programme to see if any measures were particularly linked to high performing leaders. Secondly, we surveyed 123 Teaching Leaders Fellows and alumni and asked them about their role, priorities and how they spent their time. Third we picked four middle leaders from a random sample and four from ‘stand out’ departments and visited them to carry out in-depth interviews and identify anything particularly distinctive about the outliers. As part of the visits we interviewed 24 middle leaders, line managers and department teachers. Yet no department is an island and our interviews showed that in order to implement clear procedures and systems within their departments, middle leaders need senior leadership to promote these same systems across the whole school. One middle leader argued that their departmental systems for managing behaviour were undermined by weaker behaviour management across the school. As well as tapping into external research and ideas to inform their work, at the other end of the cycle, the best middle leaders also spent much more time on self-evaluation and this was the self-reported behaviour with the largest effect on a department’s relative performance. But not everyone was singing from the same hymn sheet; we found that teachers, middle leaders and senior leaders tended to emphasise slightly different things. Teachers focused on middle leaders’ ability to delegate and senior leaders were more likely to talk about them being results-driven. It also seems that senior leaders may be applying the ‘no excuses’ mantra to middle leaders as well as pupils, since they were less likely than heads of department themselves to comment on factors that could hinder middle leadership’s effectiveness. As always, it seems the challenge for senior leaders is to get the right balance between high expectations and empathy. It may seem obvious, but building strong relationships with your team really matters. Getting that engagement through a real clarity of purpose, effective two-way communication, managing conflict tactfully and, most importantly, through supporting your team to grow professionally, builds strong discretionary effort and an effective team. People who feel more engaged with their work and their team are also much more likely to remain in their role. Middle leaders play a crucial role in increasing teacher retention. They may not always seem as important, but making sure you do the basics well is crucial. It frees up your team to focus more on what they should be doing – focusing on the quality of teaching and pupil progress. Meetings should be well run, processes for lesson and curriculum planning need to be fit-for-purpose and lesson observations and data analysis need to be effectively executed. Ensuring you have readily available, accurate pupil performance data, good systems and processes builds the effectiveness of the team and their willingness to go the extra mile as they can see they are working in a properly planned and organised team. Knowing where your team members’ strengths lie and planning for opportunities for them to take a lead in these areas is a great way of sharing out the workload of your team and enabling them to grow and develop, so long as you do this in a way that is seen as positive and supported. Delegating is an important and yet difficult skill for middle leaders, as it is often very tempting to just do something yourself because you can usually do it better and faster! Despite the pressures of day-to-day school life, the best middle leaders take the time to keep up-to-date with the latest research and evidence, both around their subject area and the wider education and leadership contexts. They also spend more time self-evaluating to see how they can improve. Taking an evidence-informed approach to decision-making and prioritisation can have a strong positive effect on the performance of a team. Once again, it also builds the confidence and thus the discretionary effort of your team if they know you are properly engaging with research to inform departmental improvements. Twitter and networks such as Teaching Leaders, #womened and the teachmeet movement are great ways to stay connected. The report also indirectly highlights something Sir Michael Wilshaw has highlighted recently at the ASCL conference. The senior and middle leadership teams of the best schools are connected. We regularly see that middle leaders are much more effective when they are well managed and manage up well. This isn’t about surreptitiously getting your line-manager to do what you want them to without them even knowing, it’s about middle leaders taking their share of the responsibility for making sure both parties understand the pressures and needs of one another. Senior leaders need to know what they can do to support your work. Middle leaders look to senior leaders to ensure the consistent follow-through on whole school behaviour policies. This can make a real difference to the ability of pastoral and curriculum middle leaders to build a strong climate for learning within their teams. Names of interviewees are pseudonyms. You can download the full report here. Teaching Leaders’ mission is to address educational disadvantage by growing a movement of outstanding middle leaders in schools in challenging contexts. We design and deliver leadership development programmes for those leaders on the front line in the most challenging schools: middle leaders. Our high-potential and whole-school middle leader programmes transform the impact that leaders can make on pupil outcomes, retain them in their schools and build a talent pipeline for the future. In November 2016, Teaching Leaders will join forces with The Future Leaders Trust. Together we will provide outstanding professional development to leaders at all levels in schools in challenging circumstances.